Home / News / HHS to present "The Drowsy Chaperone"
HHS to present "The Drowsy Chaperone"
“I don’t know that this will be the best show Holton has done, but it may very well be the funniest we’ve done,” said Bond, director of vocal music at HHS. A send-up of Jazz Age musicals, “The Drowsy Chaperone” will be presented at 7 p.m. Saturday and Sunday in the HHS auditorium. There will also be a “dinner theatre” starting at 5 p.m. Saturday; tickets may be purchased in advance at the HHS office. The musical’s central character is simply referred to as “Man In Chair,” played by Walker Sheldon, who presents the audience with a recording of a fictional musical, “The Drowsy Chaperone.” As the recording of the musical plays out, its story and songs come to life in the man’s living room. The fictitious “show within a show” revolves around two lovers (Brandon Lehnherr and Emma Wittmer) on the eve of their wedding, a bumbling best man (Ethan Teter), a desperate theater producer (Ian McAsey), two gangsters posing as pastry chefs (Sydney Snyder and Taylor Stevens), a misguided Don Juan (Tel Wittmer) and the titular chaperone (Bre Teter). Other principal roles are played by Paige Crouch, Anna Lemon, Brody Harshaw, Savannah Phillips, Tabor Barta, Mary Gorden, Trasen Snavely, Ethan Brownell, Sydney Prine, Ahslyn Robinson and Kylie Hulse-Nelson. Bond said he was introduced to “The Drowsy Chaperone” by a friend who saw the show on Broadway and “raved about how funny it was,” then later saw a high school production in Topeka and dared Bond to put on his own production at HHS. “I did not know much about the show at the time, so I began to do some research and truly fell in love,” he said. It took time for many of the students involved in the HHS production to warm up to the show, however. 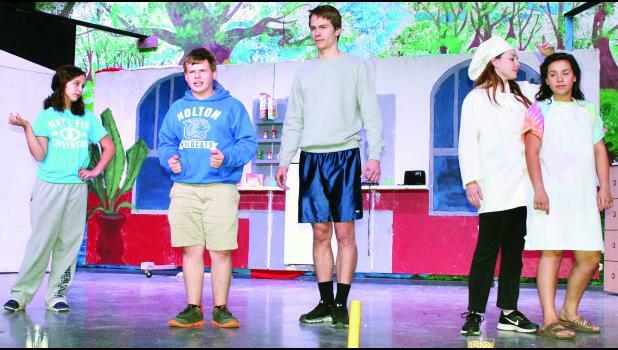 But once the students understood that the show “is really a parody of the musical genre itself,” Bond said, the story line made more sense and the students began to have more fun with the production — and their individual talents began to shiine through. Staging the show was another matter, Bond said, noting some of the ideas he came up with for the production were “a little more challenging” and limited by the HHS stage area. Choreography — one of the show’s numbers features a tap-dance routine with Lehnherr and Ethan Teter, for example —provided another challenge. Saturday’s “dinner theater” tickets include a 5 p.m. dinner with a menu of fettucine alfredo and grilled chicken, vegetable, roll, salad and dessert for $15. Regular tickets will be sold at the door for $5 each. To purchase an advance “dinner theater” ticket or for more information, call HHS at 364-2181.